This is a fun (and relatively easy) recipe to make. 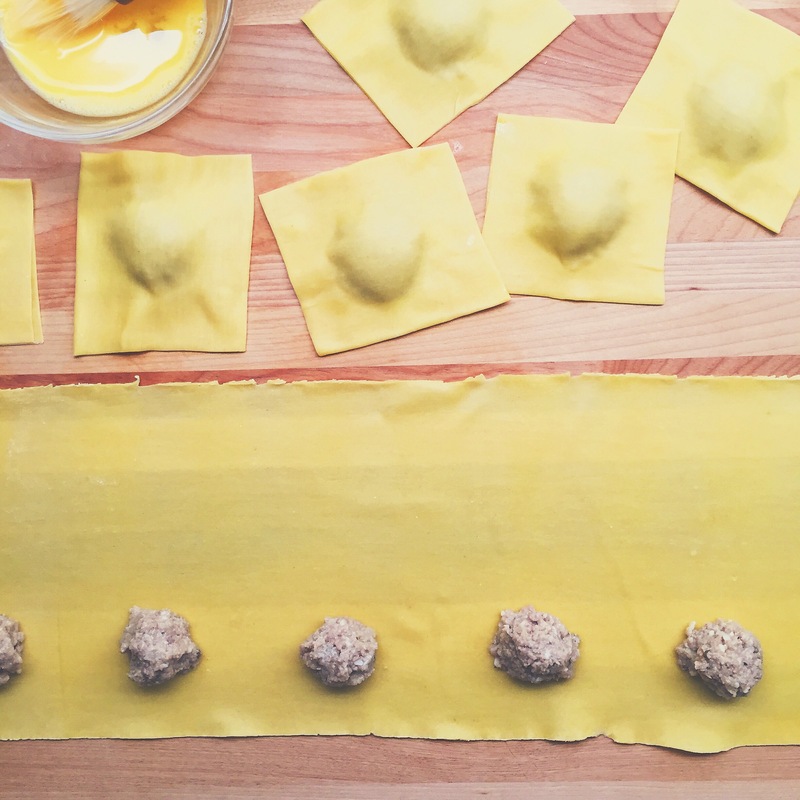 I wanted to make some sort of simple meat filled ravioli but didn’t have much luck finding a recipe when I googled, so it was easy enough to make up my own. This was also a good opportunity to try out Flour + Water’s ravioli dough recipe , which was fantastic! 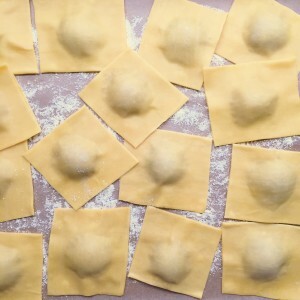 You can also assemble the ravioli ahead of time, which makes life a lot easier if you serve these at a dinner party. And of course, they can be frozen to cook at a later time. First, make the pasta. Combine the flour and salt on a clean work surface, gather into a small mound and make a well in the center. Crack the whole eggs and egg yolks into the well. Add the olive oil and begin stirring with a fork. Gradually stir in the flour from the perimeter of the well until eventually the dough becomes too stiff to stir with the fork. Use your fingers to work the flour into the dough. You may not need all of the flour. Once the dough looks shaggy, clear away all remaining bits, and lightly flour the clean surface. Begin kneading the dough by pushing it away with the heel of your hand, folding it over, giving it a quarter turn, and pushing it away again. Do this for about 5 minutes. If the dough feels sticky when you press your finger into it, dust a little more flour on the dough and continue kneading. Knead the dough another few minutes until if feels somewhat soft to the touch. Dust with flour and wrap in plastic or a towel, and let rest for 30-60 minutes. Next, make the filling. Heat 2-3 teaspoons of butter and 2-3 teaspoons of olive oil in a pan over medium heat. Add the onion and garlic, cooking just until onion begins to soften. Add the sausage and cook until no longer pink (about 5 minutes). Scrape the mixture into a food processor and pulse until the mixture is finely chopped. Pour into a bowl to cool. Once cool, stir in the parmesan and season with salt and pepper if needed. Stir in the egg. Once your pasta dough is ready, cut the dough in half, keeping one half wrapped up. I use the kitchen aid pasta attachment, but the hand crank pasta maker works just as well. Flatten the pasta half with your hand to make it a little easier to squeeze into the machine. Set your pasta maker to widest setting and run the dough through, flouring the dough if necessary. Run it through the widest setting a second time. Repeat this process on the next setting, running the dough through twice. Continue gradually going thinner and thinner until you can see through the dough, but it’s still thick enough to hold your ravioli filling. I found that setting 6 was just right. Lay out a sheet of dough on a clean work surface. Place one heaping teaspoonful of filling on the bottom half of the pasta sheet and space out each scoop of filling about one and half inches. Brush the top and bottom of the sheet with the egg wash and then brush the areas between the filling. Fold the top of the dough over the filling to line up with the bottom of the dough. Press the dough on the edges and between the filling to seal. Using a pizza cutter, cut the ravioli apart. Place the finished ravioli on a sheet pan lined with parchment paper that is heavily dusted with semolina flour. At this point, you can refrigerate them for up to one day or you can put the pan in the freezer, and once frozen, transfer to ziploc bags or another container. To cook, bring a pot of water to a boil, and boil for about 3 minutes, or until al dente. I served these with a simple sauce of 4 tablespoons of butter, 1/4 cup chicken stock, and about 1/2 cup of the pasta cooking water. Toss the ravioli in the sauce immediately (sauce will thicken a little). 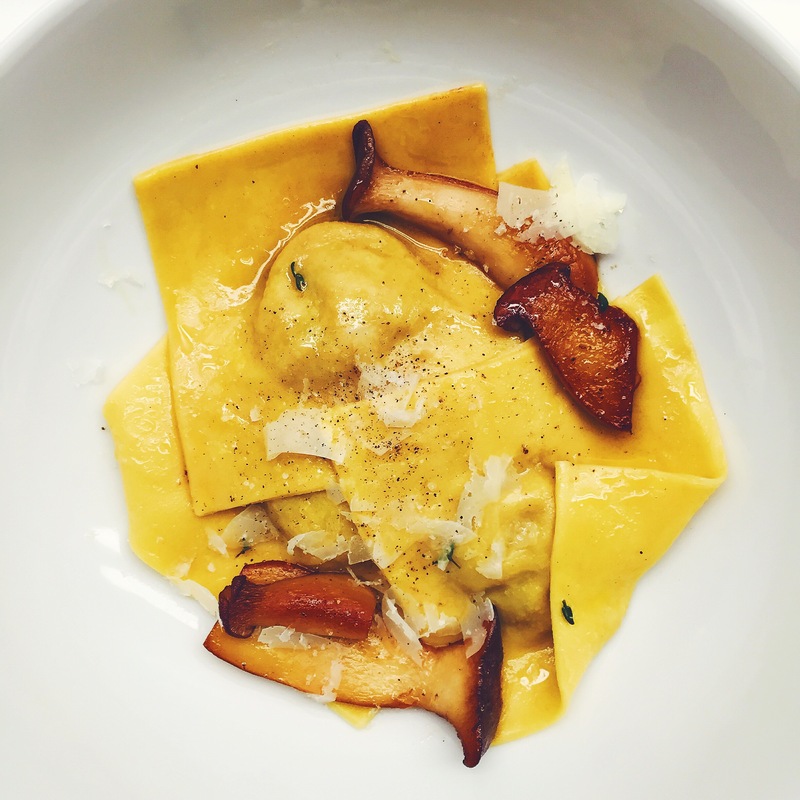 I also sautéed king trumpet mushrooms with a little thyme and added them to the sauce when I added the ravioli. Top with shredded or shaved pecorino or parmesan.